In one spot they found themselves "picking a few hedgehogs right out of the snow banks." The next day they drove up the Chetco and "saw very little snow." The patch they "went to was clear of snow, and the black trumpets seem to have survived." 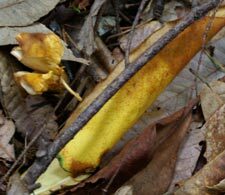 They even "found some chanterelles which were in good shape (they usually get frozen out and rot when it snows on them)." 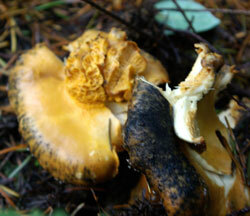 chanterelles and make them harder to identify! It's the holiday season, and we wanted something a little special for our Saturday dinner guests so we selected the recipe that "Travel Oregon Magazine" published from Wildwood Cafe & Catering in Welches, Oregon. It's a lovely salmon preparation that we enhanced with a simple crab filling (crab meat blended with a touch of mayonnaise, an egg, and a hint of mustard and celery salt) for our guests. to tell the mushroom from a leaf! Welcome to our web shop! You knew it had to happen, right? 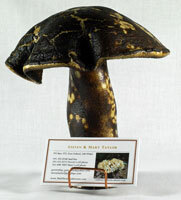 Someone would offer mushroom- themed products for sale on the Internet, and that someone turned out to be us. We hope it will be a long and enjoyable trip for all of us… and henceforward, the dilemma of what to buy that special mushroomer in your life has just become a little easier. We’re excited to be offering unique, quality gift items for mushroomers, and will regularly add new items as time goes on and as we learn more about you, our readers and customers. We’re a small, man-and-wife operation, but what we lack in size, we’ll make up for in good, attentive personal service. We hope to have you for a customer for as long as you’re interested in mushrooms, and we’ll earn your business with unique, high quality products, fairly priced and promptly shipped. If for whatever reason we cannot ship in time to arrive for a specific date that we’re aware of, we will be happy to send to the recipient a picture of the item on an attractive card, with a note explaining the delay and stating when it will be shipped (also stating that it’s not your fault!). We sell only products made in the U.S. or Canada, and for now, all our suppliers are located in Oregon or Washington. We think there are plenty of imports without our adding to the list, and we want to deal with people we know and trust. That’s not always possible when your supplier is thousands of miles away. It’s always possible we might find an overseas supplier or product so outstanding that we simply have to offer it, but for now, if you see it here, it’s from here. Try as we might, we can’t guarantee against situations when we’re out of stock. When that occurs, we’ll contact you for instructions. If you are dissatisfied in any way with your purchase from us, call us and let us know. Then you can send it back for a prompt, full refund. We would really appreciate any feedback you can give us – via card, letter, e-mail, phone call or any other way you can come up with. What new things would you like to see on our website, and in our web shop? We’d love to hear from you! We are including our own phone number for you to contact us directly, too. It’s 541-332-0166, or cell phone 541-425-0213. We apologize in advance if you get a busy signal on the 332 number; all we can get here is dial-up internet service, so sometimes the line will be busy. Calls to the cell phone should go right through. We ask only that you not call between the hours of 8:00 PM and 7:00 AM, Pacific Time. We need our sleep, too, if we’re going to be of good service to you! Although the talented artist who produces them calls them “fungal spirits”, we prefer “Mini Mushrooms,” so that’s what they’ll be for now. These imaginative little guys may not be much for flavor, but they’re loaded with personality, and each is individually shaped, so no two are alike. Equally at home in a place of honor atop your desk or computer as they are in a planter or terrarium, they range in size from approximately 5/8” to 2-1/4” tall, are made from durable polymer clay, and come in a variety of colors, as shown in the photograph. These attractive, yet inexpensive earrings will let any and all know of your interest in mushrooms without your ever saying a word! Also made from durable, color-fast polymer clay, they have silver plated hardware, and come in three styles: Amanita, Chanterelle and Morel. Please specify first and second choice. “Tis the season,” these mini-wreaths seem to sing, festively adorned with the same tiny mushrooms as go into the earrings, above. These are perfect for a holiday flower arrangement or display, or perhaps decorating a package for that very special mushroomer on your list. Approximately 5-1/2” diameter, made of durable (though artificial!) materials. Supplies Limited! These simple cookie cutters solve that age-old dilemma, “How to make a cookie look like a mushroom?” They can also be used for biscuits or a variety of other foods, like pancakes, omelets, croutons, appetizers, tarts and pies, cakes, fruits and vegetables – pretty much anything. They come in two sizes, Standard (4 to 4-1/2” high) and Mini (not pictured - 1-1/4 to 1-1/2” high). Supplies Limited! If you’re serious about food preservation (and what mushroomer isn’t? 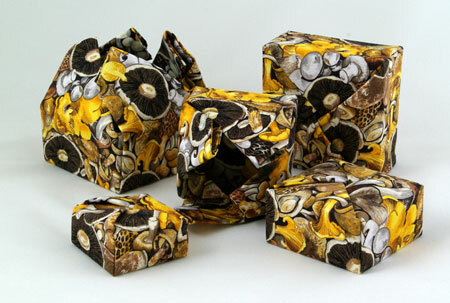 ), then you care about what your ‘shrooms look like after they’re preserved. What more elegant finishing touch could there be to your precious home-canned mushroom jars than these elegant, beautifully crafted cross-stitch covered lids? Anyone who has done cross stitch knows these are really labor-intensive, but every person who sees them will be impressed! 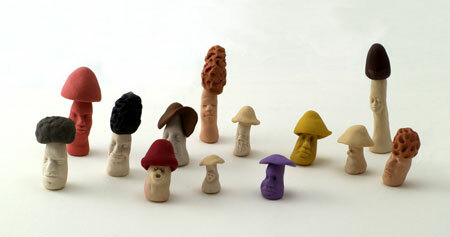 They come in assorted mushroom designs, and will fit wide mouth jars only. We think we know something about wood (living in a log home does that to you! 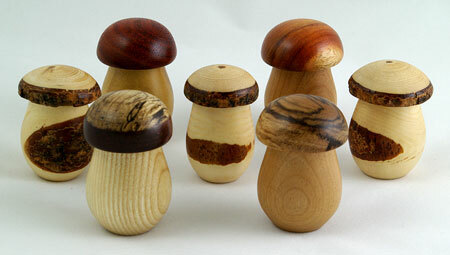 ), but the more we looked at these handsome wooden mushrooms, the more we realized that this artist definitely knows how to operate a lathe! That was before he popped the top off of one, and revealed that it was actually a container! Each is uniquely beautiful, and is made either smooth finished (approx. 2-5/8” tall), or incorporating a bit of the bark for a more rustic look (slightly smaller, at 2-1/2” tall). Both have inside bores of approx. 7/8” Diameter, 1-7/8” deep. We don’t know anyone who wouldn’t enjoy having at least one! When we first saw these on display by a local artisan, we said, “Aw!” with a big smile. They’re really cute. Then we touched them, and we were astonished at how soft and nice they are to stroke and to hold! 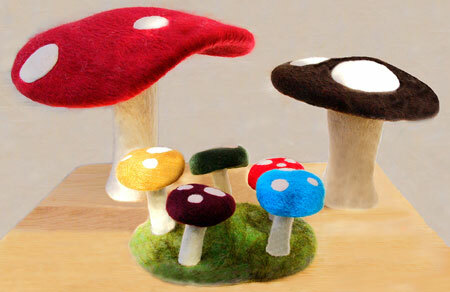 You might be tempted to class these plush, colorful ‘shrooms as something for kids, but don’t be too sure. They’re individually hand-made by a skilled local artisan using a laborious technique called “needle felting”, with a single needle, and using primarily locally raised wool (the “natural” color used for the stems sometimes comes from outside the northwest). Pictures don’t do them justice, but the close-up gives some idea of the luxurious surface texture. They come in small, medium and large, or in the ring you see pictured with five small mushrooms on a patch of “grass.” Colors are red, gold, blue, green and brown, in addition to natural. Please note: these are produced expressly for your order, rather than taken from stock. Please allow up to 10 days from order entry to shipment, and please specify first and second color choice. Bear in mind that colors vary somewhat between dye lots. These items ship direct to you from the artisan. 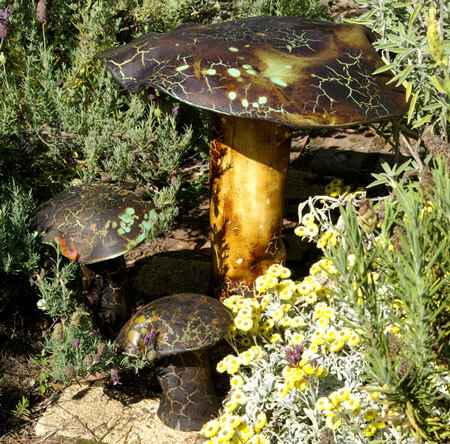 These fanciful mushrooms would make a lovely and durable addition to your lawn or garden, or anyplace outdoors, and they’re “green” as well. Made entirely from scrap plastic pipe (which would have gone into a landfill if they hadn’t been rescued by our local artisan! 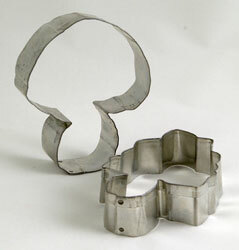 ), they could be a striking accent outdoors or in… one is even made as a business or recipe card holder! For long life, the cap is attached with both glue and screws, which are visible from underneath, but not from above. They come in three size ranges, and no two are alike. Supplies may be limited due to pipe availability. 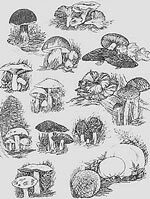 Marilyn Morrill Droege is a nationally-known artist whose portrayal of mushrooms is simply outstanding, so finely detailed that they could be photographs, but too perfectly beautiful to be anything other than what they are: creations of an exceptional artist, with a love and knowledge of mushrooms that is simply unequalled. We’ve known Marilyn for many years as a fellow member of the Puget Sound Mycological Society, for whom she has done several posters for their annual shows. 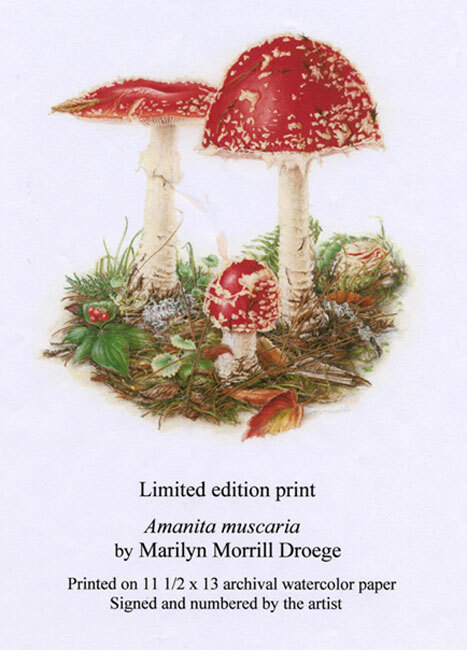 They quickly became collector’s items, as this rendition of the lovely Amanita Muscaria surely will. Among the most beautiful and widely-known mushrooms in nature (just don’t eat them! ), they were a natural if challenging choice of subjects for Marilyn. These exceptional prints are individually signed and numbered by the artist, on 11-1/2” x 13” archival watercolor paper, rolled in a protective cardboard container, ready to frame.